Please note that due to the large size of this item, we can only send it within the U.K. (items sent to some of the more remote parts of Scotland may take longer to arrive). 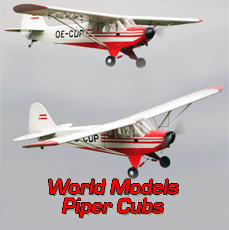 A large 1/4 scale Clipped Wing Cub Model from the Cub Experts ! 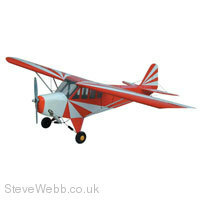 This model is more aerobatic than a standrad 1/4 Cub as is the full size version. 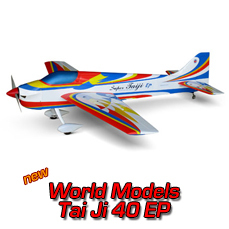 The model flies amazingly scale like on an Enya 90 four stroke or Enya 120 four stroke.Top quality balsa and plywood construction. Built-up wings with aluminum wing joiner, just like the full size. Comes with all hardware and accessories. This is the Cub Yellow with Thunder Bolt colour scheme version. Please see the other listings for Blue / White Sunburst, and the Red / White Sunburst versions. Please see the other listings for stock on this site. Wing Span : 88.0 in / 2240 mm . Wing Area : 1330 sq in / 85.8 sq dm . Flying Weight : 14.0-16.0 lbs / 6400-7300 g .
Fuselage Length : 65.0 in / 1650 mm . Engine Required : 2C 0.91 cu in or 4C 1.20 - 1.60 cu in . A large 1/4 scale Clipped Wing Cub Model from the Cub Experts ! 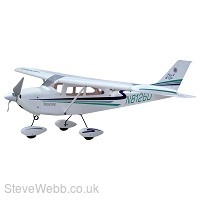 This model is more aerobatic than a standrad 1/4 Cub as is the full size version. 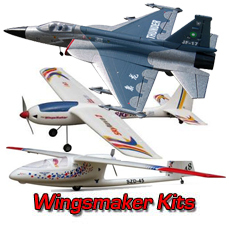 The model flies amazingly scale like on an Enya 90 four stroke or Enya 120 four stroke.Top quality balsa and plywood construction. Built-up wings with aluminum wing joiner, just like the full size. Comes with all hardware and accessories.This is the Red / White Sunburst colour scheme version. Please see the other listings for Blue / White Sunburst, and the Cub Yellow with Thunder Bolt versions. Please see the other listings for stock on this site. 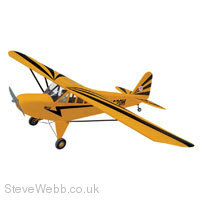 A large 1/4 scale Clipped Wing Cub Model from the Cub Experts ! 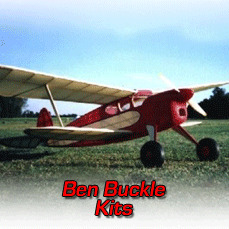 This model is more aerobatic than a standrad 1/4 Cub as is the full size version. 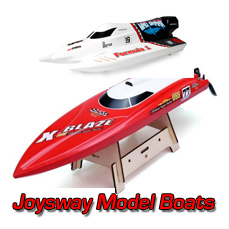 The model flies amazingly scale like on an Enya 90 four stroke or Enya 120 four stroke.Top quality balsa and plywood construction. Built-up wings with aluminum wing joiner, just like the full size. Comes with all hardware and accessories. This is the Blue / White Sunburst colour scheme version. Please see the other listings for Red / White Sunburst, and the Cub Yellow with Thunder Bolt versions. 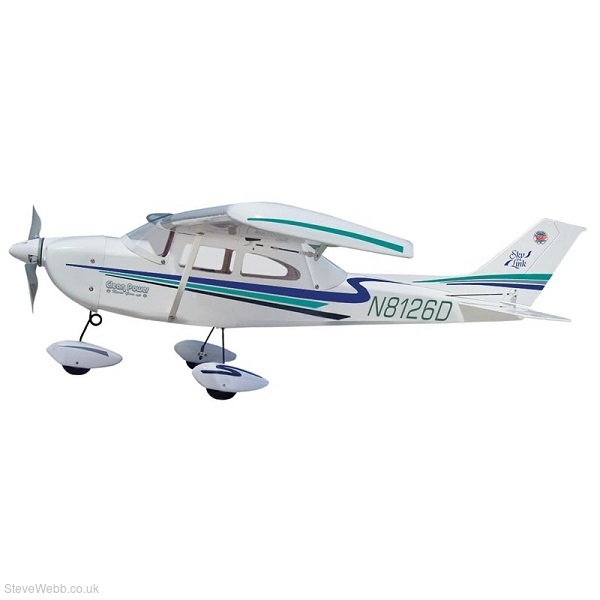 One of the best selling Electric powered aeroplanes on the market today ( the WM Cessna, now renamed the Skylink - Code E261B). 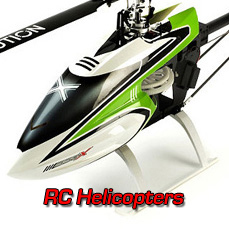 This is an All NEW Version with Brushless Motor - it replaces the old version (E191), which is no longer available. 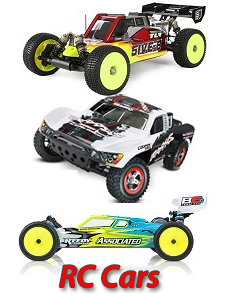 The appearance and build remain the same - apart from the improved BRUSHLESS motor perfromance - included in the kit. The very latest in light weight construction and traditional building techniques make this model one of our best selling models. 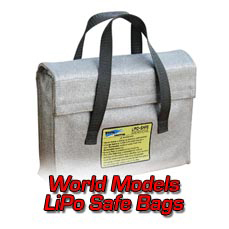 The usual World Models quality, with real heat shrink covering and glass fibre cowl. This model even features hand laid glass fibre vortex wing tips. 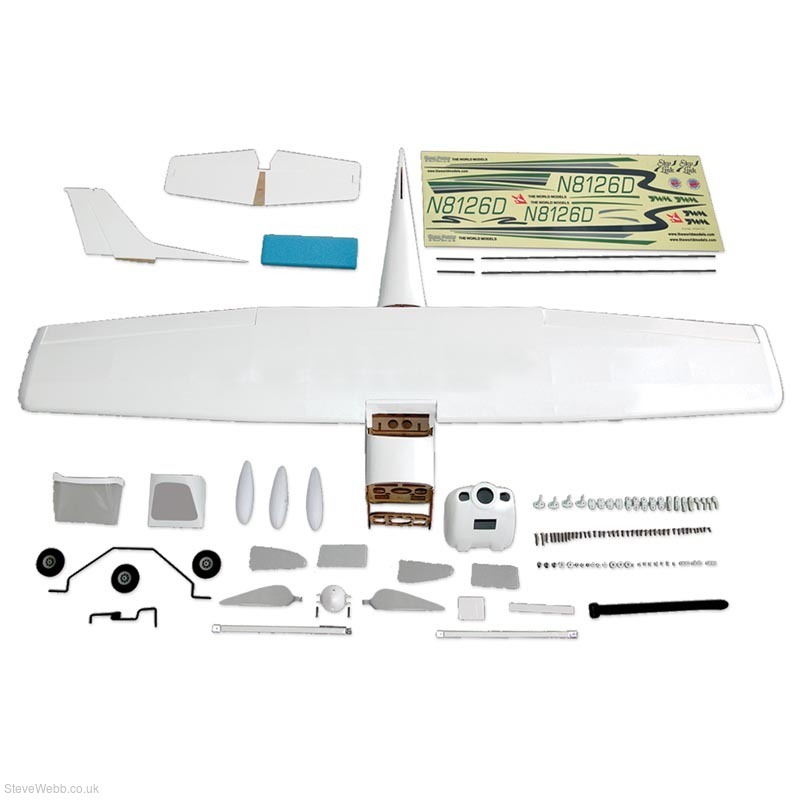 The model comes with Brushless motor and folding prop.It still represents fantastic value for money and saves having to upgrade to a Brushless Motor at a later date. Brushless Conversion Ply Firewall - CNC cut parts and accessories for this model if you still have the BRUSHED motor version. 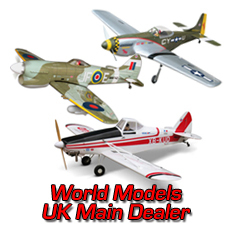 Another model from The World's Giant Scale warbirds collection. This time the classic WW11 fighter, the Spitfire. 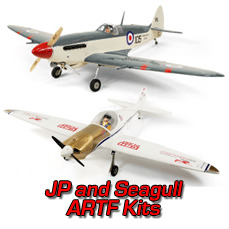 A Giant A.R.T.F that sets new standards for an easy to fly model Spitfire. Scale plastic spinner with aluminum backplate. Detachable 2-piece wing. Detachable stabilizer. Pull-pull controls on rudder and elevator for more precise control inputs. Elevator bellcrank to eliminate any differential throw. Hand painted fiberglass cowling with 3-D template. Premium hand iron-on covering film. Functional split flaps for smoother landing. Pre-installed retracts operating in the scale manner as per the Spitfire. Wing Span : 80.0 in / 2030 mm . Wing Area : 1138 sq in / 73.4 sq dm. Flying Weight : 13.0 lbs / 5850 g.
Fuselage Length : 68.0 in / 1730 mm . Engine Required : 2C 1.60 cu in (glow) or Similar.